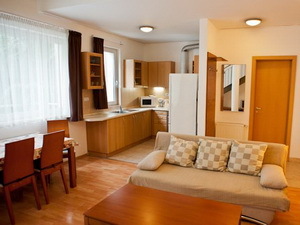 Szeged hotels. 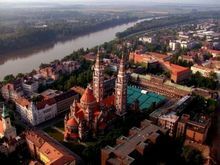 Travel guide of Szeged, Hungary. SZEGED, as cosmopolitan a place as you'll find on the Plain, straddles the River Tisza like a provincial Budapest. 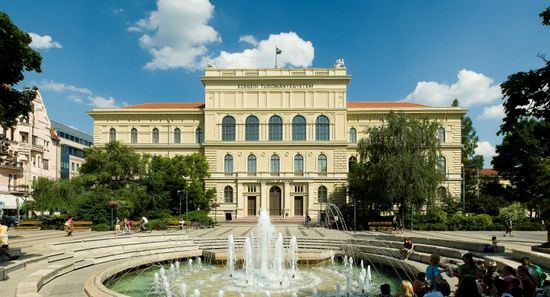 Much of its friendly atmosphere is thanks to students from the university, while the old city's eclectic good looks have been saved by placing the modern housing and industry over the river, in Ujszeged. 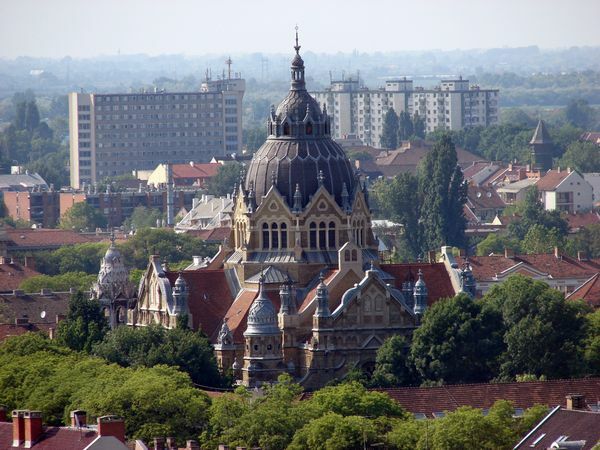 Though Körös folk settled here four to five thousand years ago, and the town flourished after 1225 because of its royal monopoly over the salt mines of Transylvania, Szeged's present layout dates from after the great flood of March 1879, which washed away all but 300 homes and compelled the population to start again from scratch. 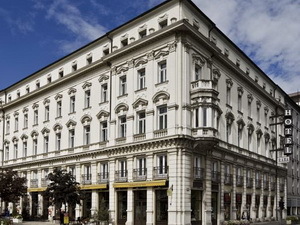 With aid from foreign capitals (after whom sections of the outer boulevard are named) the city bounced back, trumpeting its revival with huge buildings and squares where every type of architectural style made an appearance. and if I have to, even shoot". Attila's bitterness was rooted in childhood, when his mother - a poor washerwoman - died of starvation. Later he was expelled from the Communist Party for trying to reconcile Marx and Freudian psychology and, living in dire poverty, he finally ended his days under the wheels of a train at Lake Balaton. Though unappreciated during his lifetime, Attila's poetry now finds widespread favour. Head on past the university, take a left turn, and you'll come to the so-called Black House on the corner of Somogyi and Kelemen utca. This Romantic-style edifice is actually painted brown and white, but the ironmonger who lived here in the nineteenth century always told peasants "You can find me in the Black House". After this brief detour, walk along Zrínyi utca and turn right to reach Dóm tér. 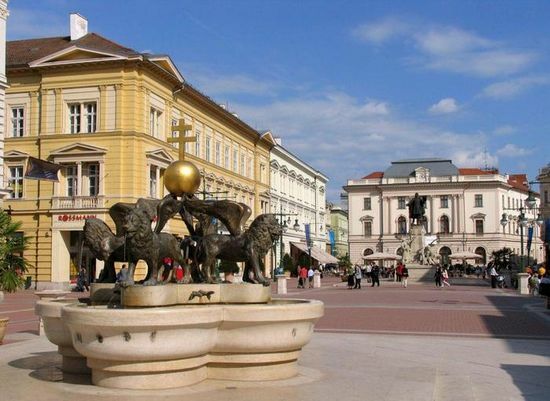 Aside from the university, the main object of civic pride in Szeged is Dóm tér, flanked by arcades with twisted columns and busts of illustrious Hungarians. This 12,000-square-metre expanse was created in 1920 by demolishing a network of backstreets, to accommodate a gigantic Votive Church which the townsfolk had pledged to erect after the flood. Built of brown brick in the neo-Romanesque style, its portal is surmounted by a statue of the Virgin whose image recurs inside the church in peasant costume, wearing embroidered "butterfly slippers". Visitors are dwarfed by the white, blue and gold interior, where the organ, with its 10,180 pipes and five manuals, benefits from superb acoustics. 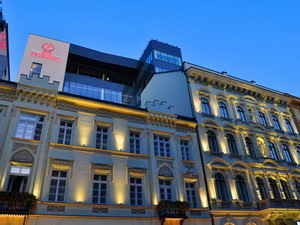 The eight-sided Demetrius Tower out in front dates from the eleventh century, but was largely rebuilt by Béla Rerrich, who designed the square. 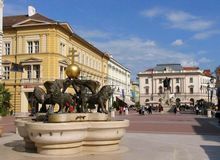 A chiming clock plays the folk song "Szeged, a famous town" at midday. On the north-eastern corner of Dóm tér stands an eighteenth-century Serbian Orthodox Church with a magnificent iconostasis framed in pear-wood. 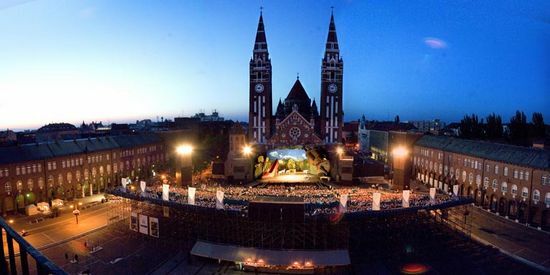 Banked opposite the Votive Church are rows of seats for Szeged's festival, where local operas are performed, some of them spectacularly melodramatic, for example one based on the life of Countess Báthori featured half-naked couples writhing in a vat of "blood". 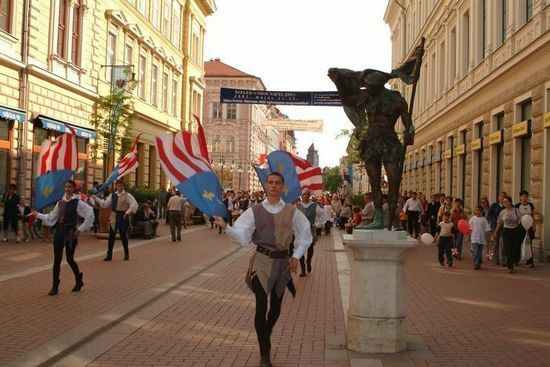 When performances (which start with every one standing for the national anthem) finish, the crowds flood out towards the Heroes' Gate (Hösök Kapuja), which links Aradi Vértanúk tere with Boldogasszony sugárút. 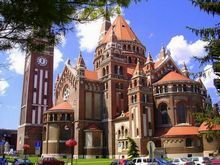 By heading north past the Serbian church, you'll arrive at Roosevelt tér and the Móra Ferenc Museum. Its Neoclassical facade of columns and decrepit statuary cloaks a typical mix of "objets d'artand" artefacts of local significance, notably a huge painting of the flood. More interesting is the display on the Avars, the people displaced by the arriving Magyars. Behind the museum you'll find another smaller museum featuring a geological display of the city. 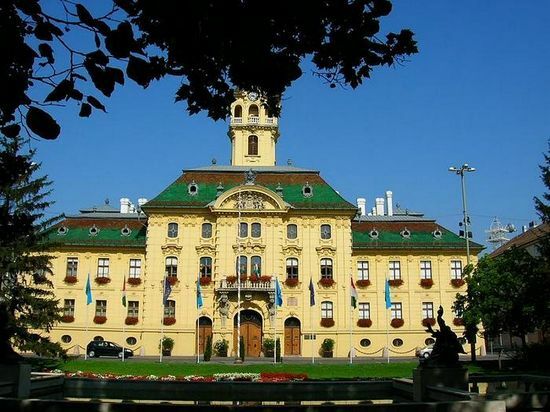 The building is sited on the remains of a castle which in later times served as a prison for the outlaw Sándor Rózsa and for convicts who laboured on the river towpaths during the eighteenth century. As in Debrecen, this was a time of mass witch trials, when victims confessed to witchcraft under torture organized by the church elders. From here you can walk up west past the National Theatre to spacious, verdant Széchenyi tér, Szeged's innercity park. 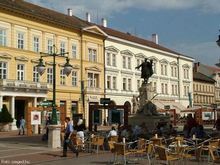 On the far (western) side stands a neo-Baroque Town Hall, likened by the poet Mihály Babits to "a lace-covered young woman dancing in the moonlight". 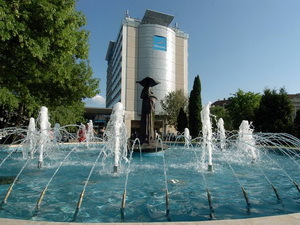 The two allegorical fountains outside known as "The Blessed and the Angry" - symbolize the benevolent and destructive aspects of the River Tisza. The town hall is linked to a neighbouring building by a charming "Bridge of Sighs", modelled on the one in Venice. 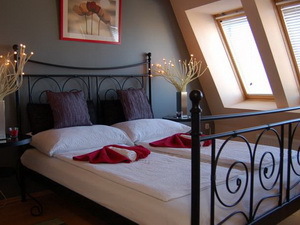 One area worth checking out is the old Jewish quarter, south of Nagy Jenö utca. Dating from 1843, the Old Synagogue on Hajnóczy utca bears a plaque showing the height of the water during the flood the building itself is only open during the summer festival, when it serves as a theatre. Around the block on Gutenberg utca is the Secession-style New Synagogue, one of the largest in Europe and occasionally the venue for concerts of classical music. Its magnificent dome represents the world, with 24 columns for the hours of day and night, white flowers for faith, and blue stars for the infinity of the cosmos. The stained-glass windows illustrate texts from The Flora and Minerals of the Jews, by Rabbi Immanuel Löw, and scenes from Jewish life. 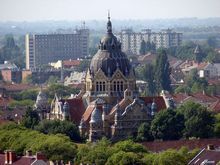 As a university town, Szeged enjoys a lively night scene with plenty of eating places and watering holes. 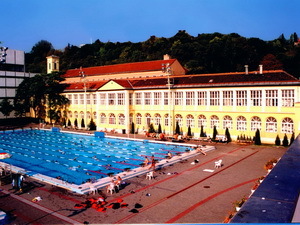 The city is famous for its sausages and dishes such as "halászlé" (fish soup) and "halpaprikás" (fish in paprika sauce). 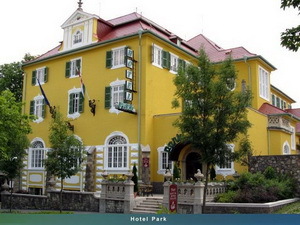 SEE SZEGED HOTELS ON THE MAP! 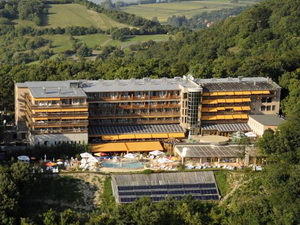 3-star hotel in Szeged, 180 kms from Budapest. Housed in a historical building from 1885, elegant Tisza Hotel offers air-conditioned rooms with free Wi-Fi, a mini fridge and cable TV. It is directly located on Széchenyi Square, Szeged's main square. 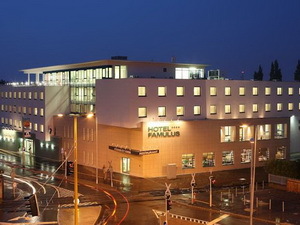 4-star hotel in Szeged, 180 kms from Budapest. 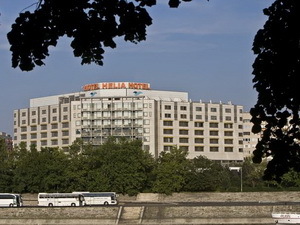 Centrally located in the most beautiful part of Szeged, on the banks of the Tisza River, this hotel is 2 km from the Cathedral of Szeged. 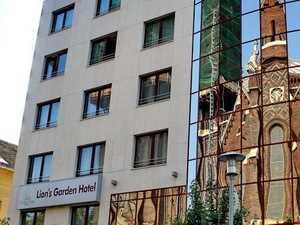 Lion's Garden Hotel is located in a very elegant neighbourhood in Budapest, in Zuglo, close the way to the Stadiums, the Arena Plaza mall, the museums on Heroes' Square. 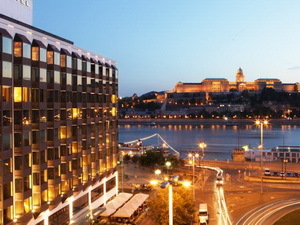 Set in the heart of Budapest, on the bank of the Danube, the Sofitel Budapest Chain Bridge offers breathtaking views of the Chain Bridge and the Royal Castle. 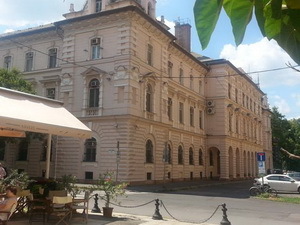 This luxury hotel is within easy walking distance of the Vaci street, major theatres and museums.